In order to locate the BeeLine transmitter, you'll need a radio capable of receiving FM and/or CW transmissions on the 70cm (420-450 Mhz) band. You'll also need a directional antenna such as a Yagi with a connector to match the radio. A signal strength meter and a tuning know come in handy as well. At the low end is a used Bearcat/UNIDEN BC80XLT receive only scanner for less than $50. It lacks a signal strength meter and a tuning knob. It is not as sensitive as some modern radios. I'm not sure I can recommend this solution unless cost is the limiting factor, but it will work for short range tracking. Next up is the Yaesu FT-277R. I really, really like this radio. It is a solidly built, 70cm single band transceiver which means you can send as well as receive FM transmissions. It has a nice signal strength meter and a tuning knob. It has the sensitivity expected of modern handheld radios. These run about $150 new, shipping included. If you are looking for a more capable radio for general purpose use on both 2 meter as well as 70cm (and more), the Yaesu VX-6R has tons of features and runs about $250. The Kenwood TH-F6a ($329) can also receive CW mode. Alinco and ICOM also make some fine handheld radios in this price range. If you want to decode the position reports sent out by the BeeLine GPS, you'll need a "modem" to decode the data packets received by the one of the radios. This modem is also sometimes called a Terminal Node Controller, or TNC. You can use a computer sound card as a modem. In this configuration, you run an audio cable from the earphone jack on the radio to the input of the sound card. Then you can use freely available software such as MIXW (www.mixw.net) or AGWPE to decode the packets and display on your computer screen. This software can be a bit tricky to set up, and doesn't work well with all sound cards. Instead of a computer sound card, you can use dedicated hardware to decode the incoming packet. There are many TNCs available. Byonics sells the TT4 which can be configured with an LCD display. In this configuration the audio cable is run from the radio to the TT4, and the GPS coordinates are displayed on the LCD screen. If the TNC lacks an integrated display, then you'll still need a computer with USB / Serial port to read out the coordinates. Some radios contain an integrated TNC. This configuration totally eliminates the need for any cabling, providing an "all in one" solution. The Yaesu VX-8R (above, left) is an excellent choice, and not much more expensive than a full featured dual band HT. Kenwood is due to release it's TH-D72 (above, right) replacement at the end of 2010. Both also contains an integrated GPS, and can send position reports in addition to receiving/decoding them. Both can be interfaced to a computer if desired, but the Kenwood reportedly will offer better support for that feature. Yeasu has recently discontinued the VX-8R, and one customer has confirmed that the new FT1DR works to decode the BigRedBee GPS signals. I've never seen one, but the pictures look very similar to the VX-8R above. There are also "mobile" solutions including the Kenwood TM-D710, Alinco DR-135. 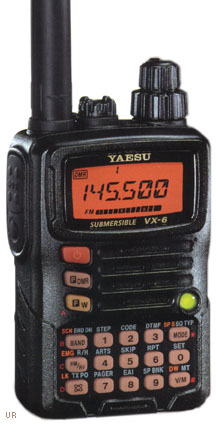 Yaesu also offers a similar model.